Thursday, November 29 6:00pm @ Quest Center. Cash for College Workshop. Financial aid experts will be available to help you complete the FAFSA and answer any questions you may have regarding scholarships, Cal Grants, and other financial aid. 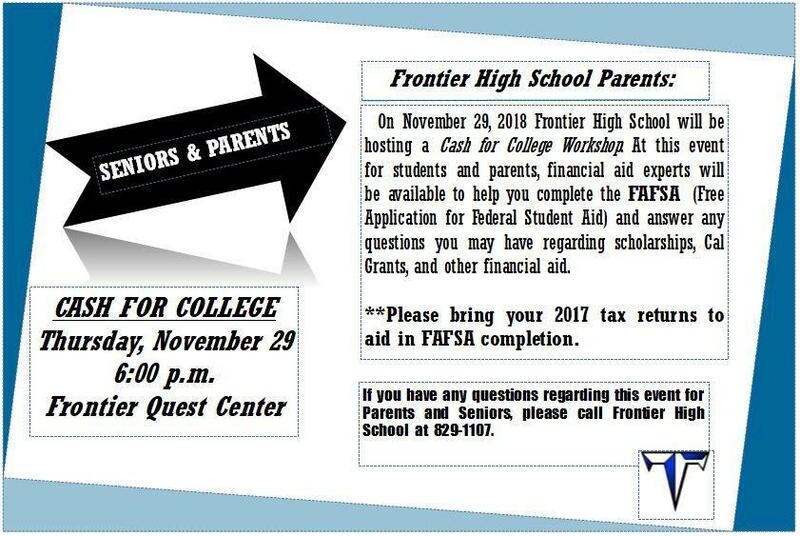 On November 29, 2018 Frontier High School will be hosting a Cash for College Workshop. At this event for students and parents, financial aid experts will be available to help you complete the FAFSA (Free Application for Federal Student Aid) and answer any questions you may have regarding scholarships, Cal Grants, and other financial aid. **Please bring your 2017 tax returns to aid in FAFSA completion. If you have any questions regarding this event for Parents and Seniors, please call Frontier High School at 829-1107.